This line runs through farmed countryside. There were pits at Dolphinton, but these were worked out about the time of the line's opening. Due to the small traffic the line closed in 1933. A large army camp at Macbie Hill re-opened the line between 1939 and 1960. This station was originally called Coalyburn. A platform remains here, overgrown and in poor condition, the base of the station building and what may be a goods loading bank. This station was to the southwest of a level crossing. The goods station was on the other side of the level crossing and the goods shed, with rather fine windows, still survives. Towards Leadburn from hill the trackbed in is very good conditions with many of the sleeper indentations still visible in what is now turf. The terminus of the line survives as a house. The stone built locomotive shed still stands. 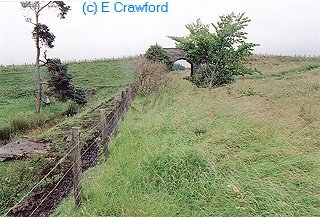 An awkward connection to the Caledonian Railway ensured that there was never a through service.